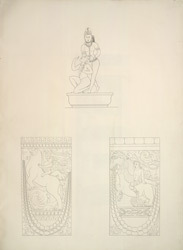 Pen-and-ink drawings of sculptures from the Durga Temple at Aihole (Top), taken by an Indian draftsman, dated 1853. The top drawing represents the couple known as Brahmachari mithuna carved on the front of a pillar of the colonnade that surrounds the Durga Temple at Aihole. A richly crowned woman with a massive presence is holding a kneeling Brahmacharin by the topknot of his head. The Durga Temple is the largest and more elaborate of the temples at Aihole. It was erected at the end of the seventh century during the Early Chalukya period. It is built on an apsidal plan and is elevated on a high plinth. An open colonnade surrounds the temple which consists of a sanctuary with an ambulatory passageway, a columned hall and a porch with balcony seating. The sculpture that adorned the temple are among the finest of the Early Chaluky period. preserved many Hindu and Jain temples which belong to a period that goes from the sixth to the 12th centuries, belonging to the Early and Late Chalukya periods and to the Rashtrakuta era.